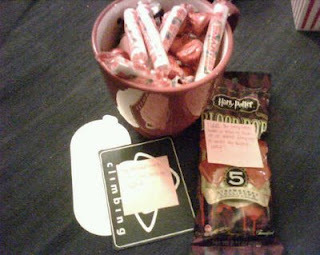 Scientific Nature of the Whammy: Favorite Things Swap! Guess what? The other day I got something FABULOUS in the mail. It was my package from Emily! I wanted to wait a little bit to open it since I had just mailed mine, but I only managed to wait a day. Oh well! I apologize in advance for the crappy pictures - they certainly don't do the package justice! But, my camera is broken (again) and has been sent away for repairs, so I had to make due with my camera phone. I slowly unloaded the box and found many spoils! A pretty pink polka dot mug with hot chocolate (yum! ), Hershey kisses, Smarties (love them!) and Harry Potter suckers as well as a couple of stickers because Em loves rock climbing. Nail polish! I put nail polish in my package too, of course. 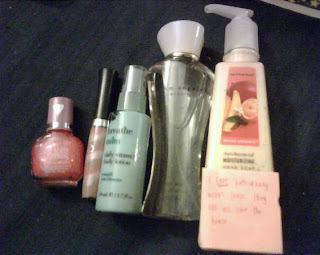 She also sent me some lip gloss (which I will be lucky not to just put on my lips and lick off because it tastes like candy), really good smelling 'calm' lotion, some Bath & Body works lotion and last but not least a bottle of dream angels perfume from Victoria's Secret, which I've never bought, but it smells WONDERFUL! Em loves Disney, so she sent me some stickers and a Cars bottle (which I have been letting my son carry around as he LOVES that movie). There was also a popcorn tub with popcorn in it, which I not only love, but is a great snack to eat on Weight Watchers because you can eat A LOT for very few points. I had seen on her blog that Em likes Hannah Montana, and I too am guilty. 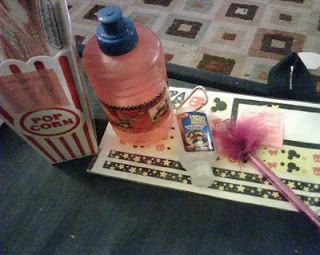 So, she sent me a cute Hannah Montana pen, along with a container of High School Musical Hand Sanitizer. I laughed out loud, because I also love HSM, and at that point my husband asked "Why were you made for each other?" A really cute little flower painted wood block (now residing in my kitchen), a small star Christmas ornament (love stars) and a framed photo Em took. 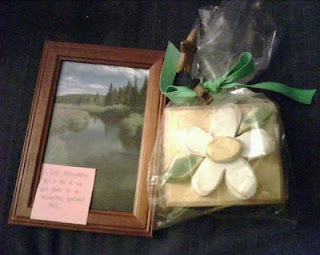 I also included a framed photo I'd taken in my package, since I love taking flower photos, so that was pretty cool. And, lastly, the books! 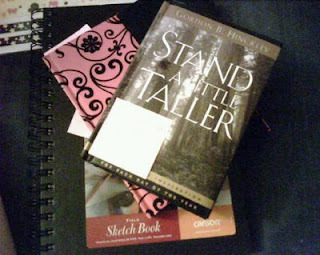 Em sent me a sketch book, a really really cute pink blank book with black velvet patterns & a magnet closure, and "Stand a Little Taller", which is a book of daily devotionals. 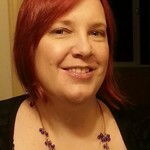 I read Emily's blog after we were matched as swap partners, and we have common interests as well as some similarities in other areas. One of the absolute BEST parts of the package was getting a note from her that she had gotten some good news in an area of her life she'd been hoping for! I was so excited for her. I also cannot believe how good a match we were - I have looked through a lot of posts, and out of all the prizes I've seen none of them would have been better suited to me than what Emily sent! Talk about luck! I had an absolute blast doing this swap, and can't wait to do it again! To see what other people got for their swaps, visit Mamarazzi at Dandelion Wishes! How fun! I love getting things in the mail that aren't credit card offers or bills. =) Thanks for stopping by my blog today. Enjoy your goodies! Lots of fun stuff to get in the mail! Please stop by my blog, Eat at Home and leave a comment today. Each comment is worth $1 for the Global Food Crisis fund and all you have to do is comment. 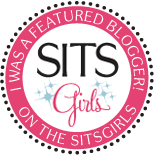 SITS girls are great at that! Wow you did great with your swap gift...enjoy..
WOW great stuff. i am so glad that you had a good time. I am so slow in getting around to everyone who participated in the swap but I just wanted to make sure THANK you for playing and for sending such a fantastic package to your partner. I know she really appreciated it. My next swap is set for April and I will announce it soon, keep and eye out for it if you want to play again…they fill up FAST!! In the meantime come by and enter my latest giveaway…very fun stuff!